Released August 2006. Prokofiev’s enchantingly surreal commedia dell’arte masterwork is turned into a spectacular triumph of total theatre in this vital production from the Amsterdam Muziektheater. 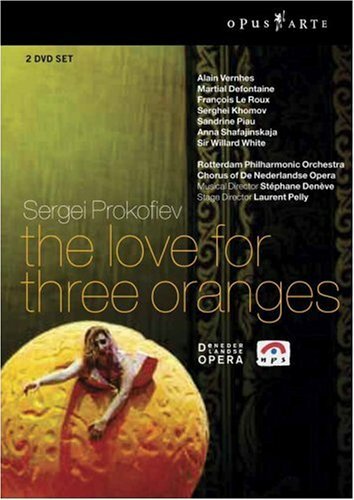 De Nederlandse Opera has chosen to use the more flexible French libretto of the 1921 premiere, a pertinent choice which has the advantage of accentuating the aesthetic common ground shared by Prokofiev and Les Six. Stéphane Denève’s brilliant musical direction inspires outstanding performances from the soloists and the superb Rotterdam Philharmonic Orchestra, enhanced by the smart, blockbusting staging of Laurent Pelly and the exquisite sets of Chantal Thomas, which propel this feverish fable to great heights. …a witty and sparkling performance that rushes past your eyes like a whirlwind. The French producer Laurent Pelly and his team have created two hours of pure enjoyment. … Pelly lets the events of the plot unfold in a most inventive fashion, letting them tumble over each others’ heels. He creates a surrealistic atmosphere that is miraculous, strange, witty and above all gripping. … The splendidly playing Rotterdam Philharmonic Orchestra hustles along with the difficult score as if it were nothing; thanks to conductor Stéphane Denève, the stage spectacle is perfectly accompanied. 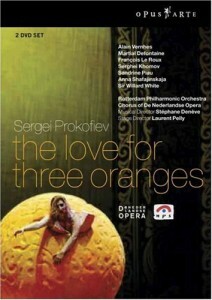 This, in combination with the excellent singers, makes this production a true and rare feast for both eye and ear.